All the innovative features of Ed's K.I.S.S. (Keep It Super Simple) are in the P.E.C.K. (Precision Engineered Compact Knife). The folders have only two major componentsublade and frameuprecision fine blanked for superior fit and smooth operation. The ingenuity of the Frame Lock® design is that the secure, safe and strong blade lock serves not only as part of the frame, but also as the handle itself. A thumb stud is used to one-hand open the blade, and as the blade is fully rotated open, the Frame Lock snaps crisply in behind the blade to guarantee a sound lock-up. 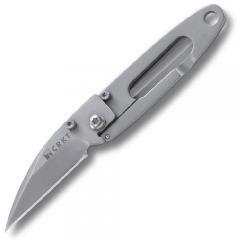 The blade can be closed with one-hand by simply releasing the Frame Lock.